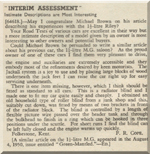 Over the years of collecting material for the Reprinted Articles, a number of other pieces where only a passing reference to the MG Y Type have been found. These are more in the way of smaller press cuttings than full articles, but nonetheless may be of interest. The publication is credited on the snippet. All files are in PDF Format for which you will need Adobe Acrobat Reader. If you have not got this installed on your PC you can download it free here. All files are in PDF Format for which you will need Adobe Acrobat Reader. If you have not got this installed on your PC you can download it free here. The Y is the second car in the line! Dundee Courier and Advertiser, May 14, 1947. 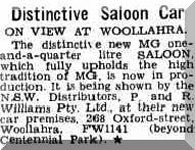 The West Australian, May 9, 1947. The Argus (Melbourne), August 27, 1947. The Sun (Sydney), November 5, 1947. The Sun (Sydney), November 14, 1947. 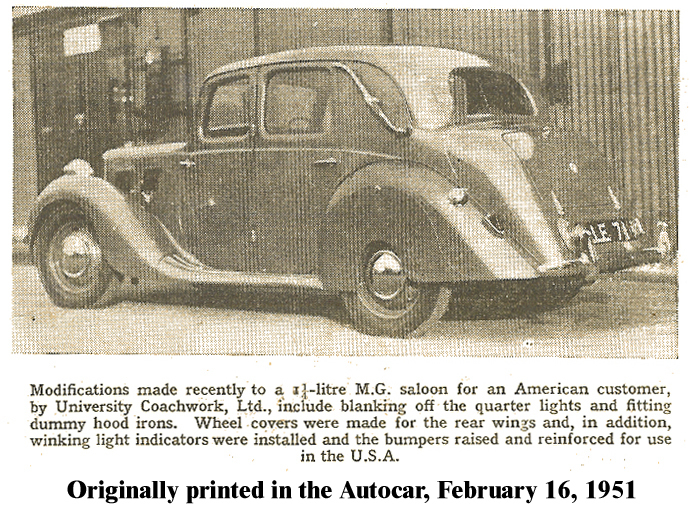 The Autocar, 15 April 1949. Extracted from Disconnected Jottings, The Autocar, April 15, 1949. The Sun, Tuesday 12 July 1949. 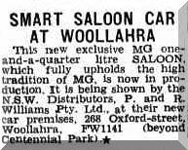 The West Australian, January 5, 1950. The Argus, April 6, 1950. 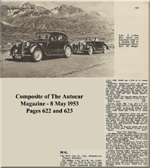 The Autocar, 5 May 1950. 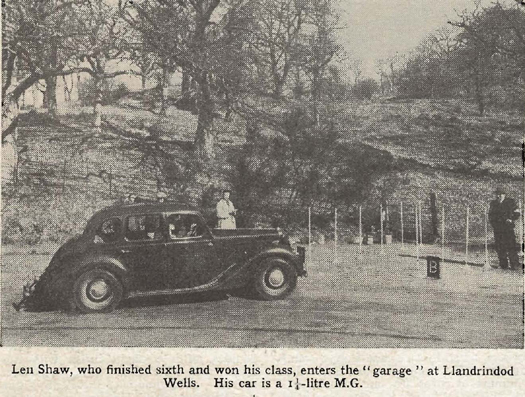 Simm's Hill - Autosport January 5, 1951. An "Exeter" favourite which ofteen blasts hopes of a Premier Award. C. Griffiths (1 1/4 litre M.G.) was one of the many standard car drivers who took part in this event. The Autocar , March 2, 1951. The Autocar, April 6, 1951. Do I see 5 MG Ys?. Page 829, The Autocar, July 13, 1951. The Autocar, September 28, 1951. Daily Mercury, December 19, 1951. The Morning Bulletin, January 2, 1952. 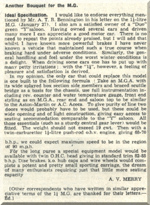 Page 457, Autosport, April 11, 1952. Peter Bolton (MG) taking the hairpin during elimination tests for the RAC Rally of Great Britain. 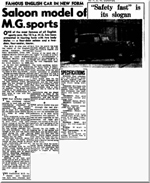 Page 556, Autosport, May 2, 1952. Welsh Weekend Award Winner G K Hale (1 1/4 Litre MG Saloon) winner of the Allen Trophy. The Autocar, May 16, 1952. Picture of Michael Brown's YA registration no LPG 796. 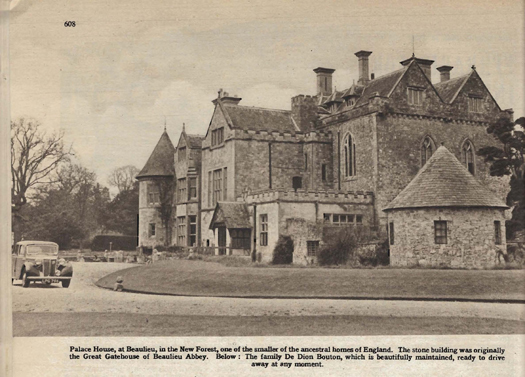 The article this picture was featured in was about the opening of Beaulieu Palace House to the public. Page 500, The Motor, May 14, 1952. CLOSE COMPANY throughout the touring car race was kept by Jacobs (M.G.) and Bennett (Javelin), the former passing on the corners and being re-pased on the straights in a highly exciting duel. The Autocar, May 22, 1952. A H McGrady (M.G.) forces it round the top hairpin in the final tests on the promenade. 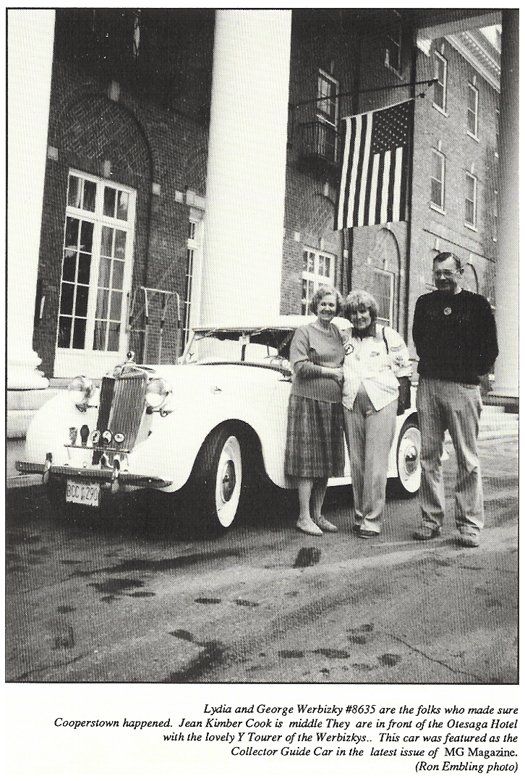 The car was participating in the 'Heat Wave Rally' or the Lanacshire Automobile Club's Morecombe National Jubilee Rally May 16-18 1952. The Autocar, September 1, 1952. To read the original articel to which this snippet refers, click here. The Autocar, October 10, 1952. G Bradstock, Chairman of University Motors Ltd. announces the use of YMG licence plates. The Autocar, November 21, 1952. The Autocar, December 26, 1952. Motor Sport Magazine, March 1953. Australian Motor Sports March 1953. 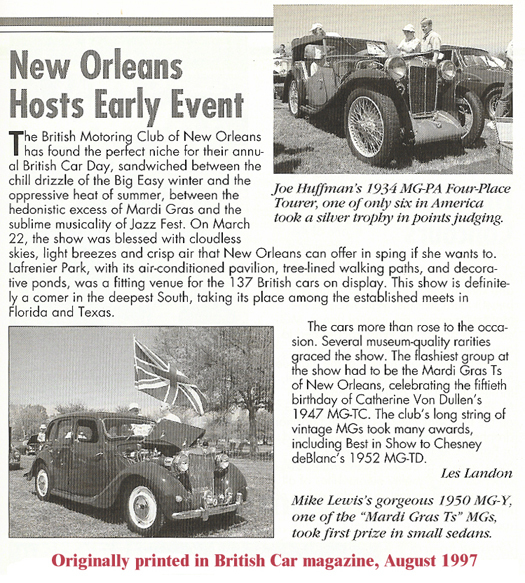 The Light Car May 1953. 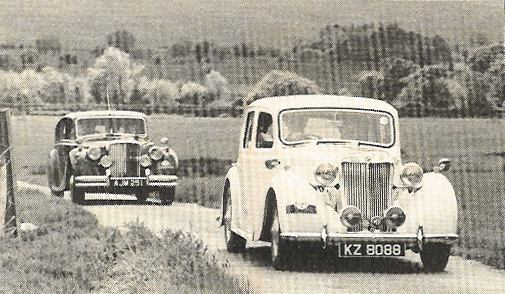 Composite of pages 622 and 623, The Autocar, May 8, 1953. 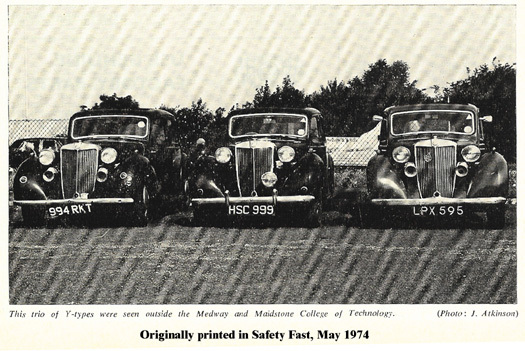 The Autocar, 10 July 1953. Page 385, The Autocar, September 18, 1953. Miss Agnes Balfour driving her 1 1/4 M.G. saloon through the snake at Boness last Saturday. A fair crowd and excellent weather attended and saw an enjoyable day's sport. Page 258, The Motor, September 23, 1953. 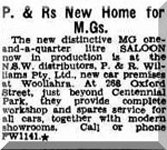 University Motors Ltd. of Piccadilly, London recently supplied this M.G. 1 1/4-litre Saloon to Sir Gordon Richards, the famous jockey. In this picture, his son, Mr. Jack Richards is seen handing the car over to Sir Gordon on behalf of the suppliers. The Autocar, November 11, 1953. Page 684, The Motor, December 2, 1953. Why and American buys a British car. The Autocar, December 18, 1953. Picture of Len Ayton's YA reg no UML 121. The article this picture was featured in was about Fog Lights. The Autocar 30, April 1954. Note the Jackall pump is in use!! MG Y is in the background. 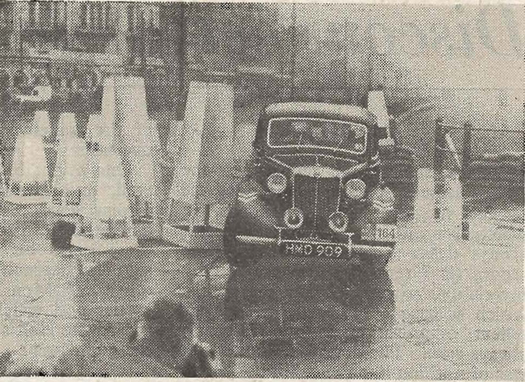 The Autocar, 27 January, 1956. Dave Mullen wrote to Mr. Binnington to see if he could recollect anything about his MG Y and he received back this interesting reply! The Autocar, 23 March, 1956. The Autocar, 27 April, 1956. Pages 465, The Autocar, April 27, 1956. The Autocar, May 8, 1959. The Autocar, January 29, 1960. 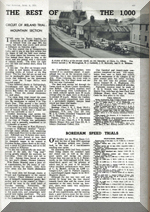 The Autocar, 22 April 1960. Believed to have been in the OLD CARS magazine, March 25 1975 - a US/Canadian publication. On Four Wheels - Issue 148 1976. 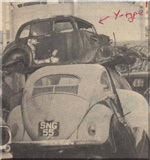 Practical Motorist, 1976 - month unknown, article on Scrapyards. Car and Car Conversions, November 1979. 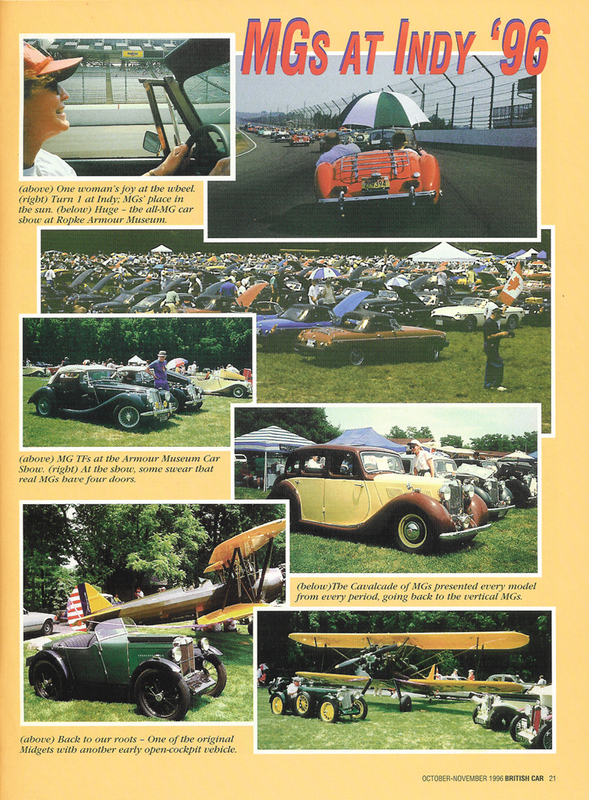 Classic and Sportscar June 1982. Automobil und Motorrad Chronik, 9 September 1982. Classic and Sportscar October 1982. 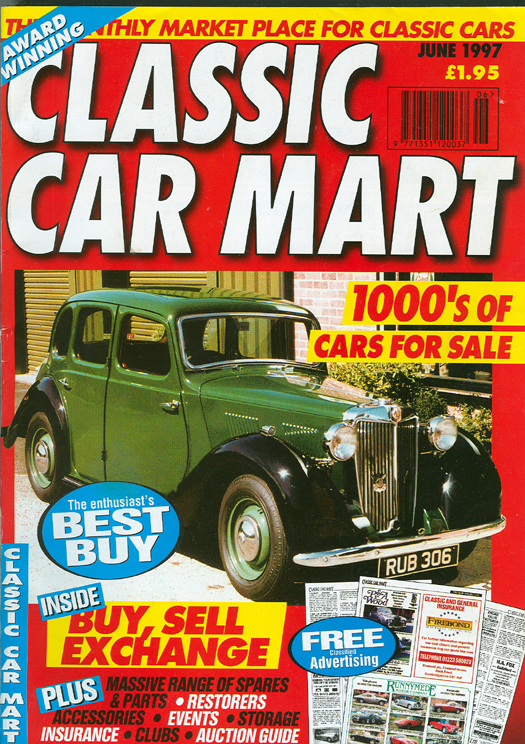 MG Abingdon Classics Magazine Volume 3 Number 10 (November 1983?). British Car Magazine, June 1992. 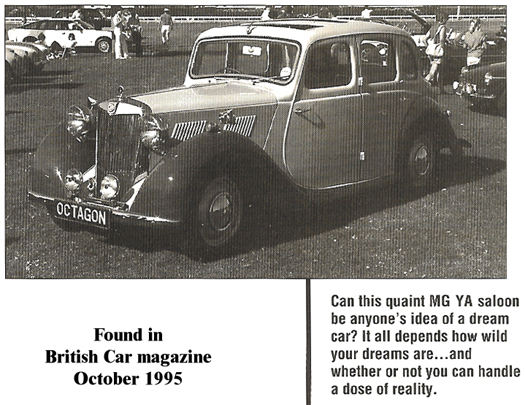 Cover girl only - the magazine did not include any article on the MG Y. 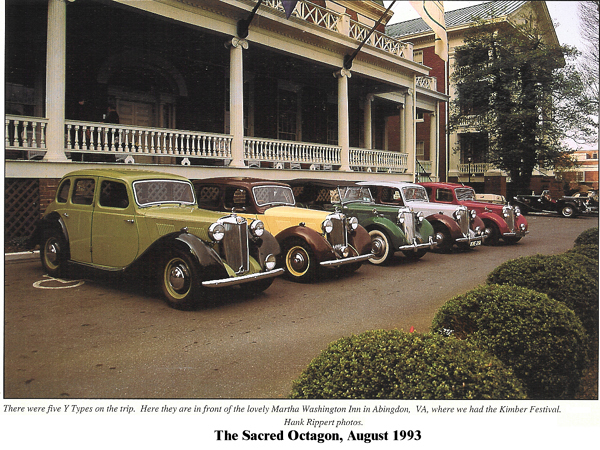 Cover picture for North American Classic MG magazine, Issue number 4 Fall 2001. Oxford Mail, December 28 2016.